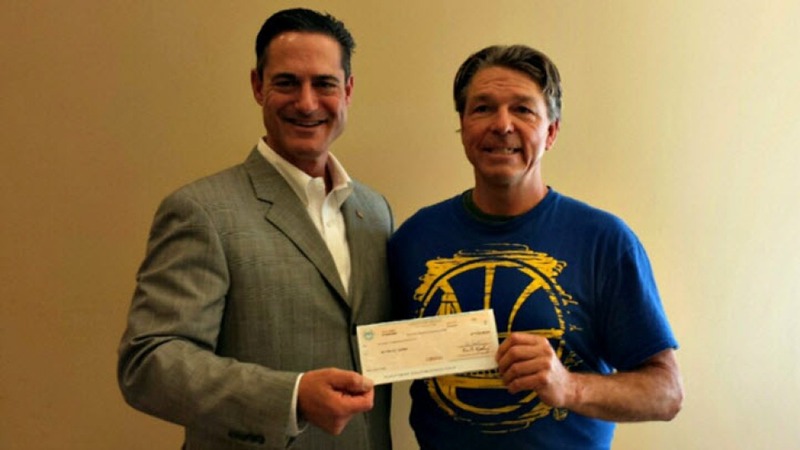 Orange County Supervisor Tom Spitzer delivered the check to the homeless man on Thursday. A San Francisco homeless man received his $100,000 reward Thursday after helping police capture three inmates who escaped a Southern California prison in January. Matthew Hay-Chapman, 55, recognized escaped inmates Hossein Nayeri and Jonathan Tieu and followed them into a McDonald's restaurant. He was one of four people to receive a portion of the $150,000 reward offered in exchange for the prisoners' capture. Hay-Chapman flagged down officers who were on duty Jan. 30 and reported seeing the two prisoners, who had escaped from a prison in Santa Ana and fled north to San Francisco. San Francisco police were able to find and capture Nayeri, who was wanted on charges of kidnap and torture, after a brief chase. They then tracked down Tieu, who had been imprisoned on murder charges, as he was hiding in a white van nearby. A homeless man in San Francisco who reported sighting a stolen van being used by two jail fugitives could end up collecting $140,000 in reward money, according to a newspaper account. Pete Suratos reports. Orange County Supervisor Tom Spitzer delivered the check to Hay-Chapman. "I had a duty to help bring these individuals back into custody," Chapman previously said in a voicemail to Spitzer. Chapman told the San Francisco Chronicle on Feb. 2 that he hoped to use the reward money to help his children and his grandchildren, who are in foster care in Oregon. KiMi Robinson and Lori Bentley contributed to this report.